1000 Brady Street, Davenport, IA 52803, USA. Pregnancy and lactation represent a period of substantial physiological changes for the mother and increased nutritional requirements to meet these adjustments. A number of nutritional depletions occur during pregnancy. Serum concentrations of iron and folate take months before they normalize to pre-pregnancy levels. Additionally, many micronutrients required during pregnancy interfere with each other, making absorption difficult. Postpartum depression is the primary complication of childbirth, possibly caused by several nutritional and non-nutritional factors. The current review highlights the impact nutrition may have on the etiology of this debilitating disorder, most notably on prevention of inflammation and maintenance of a healthy central nervous system. The most notable nutritional deficiencies associated with postpartum depression include omega-3 fatty acids, folate, iron, and zinc; however, supplementation trials for prevention of postpartum depression are severely lacking. Practical recommendations are given to minimize micronutrient interference and reduce the risk of postpartum depression. Pregnancy is a time of increased nutritional requirements to support fetal growth and development. There are several lines of thought concerning the cause of PPD, including the link between nutritional intake and risk of depression. Therefore, the goal of this review is to examine maternal depletion of nutrients, assess whether these nutritional factors may play a role in PPD, and summarize simple recommendations to implement in practice. Nearly 50% of mothers with this affective disorder are not diagnosed;  thus, screening is essential to diagnosis. Many self-reporting tools have been designed and evaluated to identify PPD including the Postpartum Depression Screening Scale (PDSS), Edinburgh Postpartum Depression Scale (EPDS), 9-item Patient Health Questionnaire (PHQ-9), and 2-item Patient Health Questionnaire (PHQ-2). The first screening tool developed was the PDSS, a 35 question survey each assessed on a 5 point Likert scale, ranging from 1 = strongly disagree to 5 = strongly agree. A cutoff score of 80 out of a possible 175 points indicates a positive result for PPD. Using the cutoff of 80, the PDSS has a sensitivity of 94%, indicating a high rate of identifying true positive cases, and a specificity of 98%, suggesting a very low false-positive rate identified by this method. These results validate the use of the PDSS as a highly selective diagnostic tool. The most widely studied diagnostic tool for PPD is the EPDS, a 10 question survey formatted on a Likert scale. Although the EPDS is similar to the PDSS, the questions posed on the EPDS are better suited to assess depression in general. Cox et al. calculated the sensitivity and specificity as 86% and 78%, respectively. Although, the sensitivity and specificity are still high, the EPDS identified less true positives and more false positives than the PDSS making the PDSS a more rigorous diagnostic tool. There is no consensus as to whether these diagnostic tools should be used at postpartum or well-child visits. Postpartum visits to the obstetrician occur at 6 weeks postpartum, prior to the peak prevalence rate for PPD. Therefore, well-child visits seem timelier for PPD diagnosis; although more research is needed in this area, as well as possibly more training for pediatricians. This lack of standardized screening of mothers represents a unique opportunity for the chiropractic community to intervene, as many women visit their chiropractor more frequently than their obstetrician or general practitioner. Essential fatty acids are lipids that cannot be made by the body and are only acquired through dietary intervention. Essential fatty acids include omega-3 (n-3) and omega-6 (n-6) fatty acids. The most important essential fatty acid for fetal growth and brain development is the omega-3 docosahexaenoic acid (DHA), found in high concentrations in fatty, coldwater fish, fish oils, and algae. The fetus accumulates 67 mg/day of DHA during the third trimester. If dietary intake of DHA is insufficient the fetus takes preference, stealing the essential fatty acid from storage in the brain and retina of the mother. Therefore, n-3 fatty acid intake may have a profound impact on PPD, as will be discussed in length later. Published guidelines for ‘normal’ or ‘deficient’ serum vitamin or mineral levels during pregnancy do not exist. Longitudinal studies have shown that serum concentrations of many vitamins and minerals decrease throughout pregnancy, though most normalize to nonpregnant status following delivery including: zinc, vitamin A, vitamin B6, Vitamin B12, and thiamin. [22–24] During pregnancy, plasma volume increases by 40–50% in singletons and up to 70% in multiple pregnancies; while only a 20–25% boost in red blood cell synthesis was found in both singletons and multiples. [25, 26] This hemodilution effect may impact plasma micronutrient concentrations, especially iron. Maternal iron stores are depleted during pregnancy and remain low for months following delivery. Iron is required for fetal growth, placenta formation, increased red blood cell synthesis, and blood loss during delivery. Iron deficiency anemia is associated with poor maternal and neonate outcomes. Iron is also an important cofactor for many enzymes; thus, iron deficiency may impact risk of PPD. Calcium requirements during pregnancy are the same as nonpregnant women (1000 mg/day), even though the fetus accumulates nearly 30 g of calcium in the third trimester or ~300 mg/day. Although, intestinal absorption of calcium doubles early in gestation, urinary calcium excretion rate nearly parallels the absorptive rate. If nutritional requirements are not met through dietary means, then calcium mobilization from bone occurs. It has been estimated that a woman’s bone mineral density decreases 3–10% during pregnancy and lactation, which is recouped within months of weaning. Interestingly, supplementation with 1,500 mg/day of calcium in pregnant women with low dietary calcium intakes actually increased bone loss, as indicated by diminished bone mineral content, bone area, and bone mineral density of the hip, and increased biomarkers of bone mobilization through 12 months lactation compared to pregnant women taking a placebo. Hence, calcium supplementation alone may not be sufficient to prevent the decrease in bone mineral content associated with pregnancy. vitamin D has been shown to increase intestinal calcium absorption and decrease urinary calcium excretion through synthesis of specific calcium-binding proteins. Recent research has suggested that vitamin D deficiency occurs in 35.8% of mothers and 58.0% of infants. Furthermore, 30% of pregnant women taking prenatal supplements were still deficient in vitamin D.  Additional studies are warranted to determine if the addition of vitamin D supplementation during pregnancy affects bone mineral content or biomarkers of bone mobilization. Both plasma and erythrocyte folate decline throughout pregnancy and take at least 6 months postpartum to normalize to prepregnancy levels. [24–33] Folate requirement is increased from 400 µg/day to 600 µg/day during pregnancy and lactation, as folate is essential for rapidly proliferating cells, DNA formation, and synthesis and secretion of breast milk. Insufficient folate intake prepartum has been associated with neural tube defects, preterm birth, and small for gestational age infants. Folic acid fortification of enriched grain products began in the United States in 1998 as a mechanism to prevent neural tube defects. Following fortification, rates of neural tube defects decreased by 26%. While this difference is significant, data from the National Health and Nutrition Examination Survey (NHANES) shows that serum folate concentrations in women of childbearing age increased 65% immediately following fortification, but has since declined 16% postfortification. Folic acid intake from fortified foods was found to be a mere 128 µg/day in women of childbearing age, according to the 2001–2002 NHANES data. Furthermore, only 40% of women of childbearing age consumed at least 400 µg/day of folic acid or folate from dietary and supplemental sources. Therefore, folate represents a public health concern as most women do not consume adequate quantities of this critical micronutrient, maternal depletion during pregnancy is evident, and insufficient levels have profound effects on the mother and fetus. Many micronutrients interact with each other, often decreasing absorption of nutrients using similar absorptive mechanisms. In general, divalent minerals (those with a 2+ charge) will interact with each other. Supplemental doses are more likely to cause these interactions than dietary sources, as supplements contain higher concentrations of micronutrients than normally found in the diet. As stated previously, calcium requires vitamin D for absorption, but calcium can decrease iron, zinc, magnesium, and phosphorus absorption; [39, 40] thus, calcium and iron should not be taken together. Hallberg recommends that when calcium supplements are necessary, they should be taken separately from a meal. The most common source of calcium found in supplements is as calcium carbonate, which has been known to require an acidic environment, such as with a meal, in order to be properly absorbed. Other dietary and supplemental forms of calcium (citrate, malate, lactate, etc.) can be easily absorbed on an empty stomach. The majority of these micronutrients are found together in prenatal multivitamins and can compete for absorption or decrease availability of others. Ideally, iron and folate supplements can be taken together shortly after a meal containing vitamin C to limit dietary interactions, while zinc should be taken separately on an empty stomach. Calcium supplements should be taken separate from iron with a meal if taken as calcium carbonate, while all other calcium salts can be taken on an empty stomach. Calcium absorption is absorbed at a maximum dose of 500 mg/serving. In general, micronutrients are absorbed at a higher rate when consumed in smaller doses spaced throughout the day, such as with eating a healthy, well balanced diet. Although many micronutrients normalize shortly after delivery, several maternal depletions remain for months. For this reason, it is hypothesized that having short intervals between pregnancies does not allow the mother to adequately replenish her nutrient stores, putting herself and the fetus at risk for severe nutritional deficiencies and adverse outcomes. Birth intervals include the period of time between weaning of one child and conception of the next. Several recent meta-analyses have correlated a birth spacing <18–24 months with an increased risk of preterm labor, low birth weight, and an infant that is small for gestational age, although the risk was mitigated with folic acid supplementation. [44, 45] Currently, no evidence exists on the effect of birth spacing on rates of PPD. Although we could hypothesize that nutrient deficiencies, seen in short birth intervals, may lead to PPD. Maternal nutritional depletions caused by pregnancy and lactation may play a large role in the development of PPD, though very few single nutrients have been studied related to this disorder. The most widely studies nutrient deficiencies and their potential impact on PPD includes: n-3 and n-6 essential fatty acids, folate, and the trace minerals (iron, zinc, and selenium). The following summarizes the current state of evidence in relation to PPD. ARA, EPA, and DHA are required for cell signaling and regulation of the fluidity of cell membranes, as they are highly concentrated in phospholipids. Approximately 14% and 17% of fatty acids found in the human brain are n-3 and n-6, respectively, predominantly as DHA and ARA. Impaired membrane fluidity can affect serotonin, epinephrine, and norepinephrine signaling and metabolism, thus influencing mood and behavior. [54, 55] Other signaling compounds produced directly from ARA and EPA include the eicosanoids: prostaglandins, leukotrienes, and thromboxanes. The n-6 eicosanoids produced from ARA stimulate the synthesis of proinflammatory cytokines. The n-3 fatty acids can decrease production of the n-6 eicosanoids, thus potentially decreasing inflammation by preventing cytokine synthesis. Patients presenting with all forms of depression, including PPD, have been shown to have elevated levels of the proinflammatory cytokines interleukin (IL)-6 and tumor necrosis factor (TNF)-alpha and the inflammatory initiator nuclear factor kappa B (NFkB). Cytokines are able to access the brain and interfere with several mechanisms possibly leading to depression, including decreased serotonin production and dopamine release, increased synthesis of corticotrophin-releasing hormone (CRH), cortisol, and adrenocorticotropic hormone (ACTH), and impaired neural plasticity. [58–63] Chronic stress associated with caregiving increased concentrations of IL-6 and C-reactive protein (CRP), a biomarker of inflammation. [64, 66] New mothers often struggle with interrupted sleep patterns and sleep deprivation, which has been shown to activate NF-kB, thus initiating the inflammatory cascade. [67, 68] Lastly, patients with high baseline levels of inflammation tend to be less responsive to antidepressants, which could account for the 30-50% of patients that fail to benefit from antidepressant therapy. [69–72] Hence, the stress associated with caring for a newborn, combined with the effects of interrupted sleep patterns causes chronic inflammation and nutritional depletions puts the mother at significant risk for developing PPD. Several n-3 supplementation trials have been conducted, mostly in patients with major depression or bipolar disorder. Supplementation studies for prevention of PPD are very limited. Nearly all analyses have used pure DHA or a combination of DHA and EPA. Supplementation in this manner has not been shown to prevent or treat PPD. [81–88] An updated meta-analysis showed no benefit for omega-3 supplementation on overall mood disorder, but the effect of DHA and EPA were not differentiated. Another meta-analysis of randomized controlled trials was able to separate out the effects of pure DHA, pure EPA, or combined EPA and DHA on general depression. Results indicated that pure EPA or supplements containing substantially more EPA than DHA were beneficial in alleviating symptoms of major depression and bipolar disorder. Due to insufficient studies using higher levels of EPA than DHA in trials for PPD, no efficacy was determined for perinatal depression. Further studies are warranted to determine the effect of EPA supplementation prior to conception or during pregnancy on risk of PPD. Furthermore, 1 g/d of EPA has been shown to be an effective adjuvant to antidepressant therapy in resistant unipolar and bipolar depressed patients. [91–94] Peet and Horrobin determined that addition of low-dose EPA to standard antidepressant therapy in moderately to severely depressed patients achieved a 50% improvement compared to a paraffin placebo with minimal side effects. Therefore, addition of EPA supplementation may be beneficial for the 30–50% of patients resistant to standard depression treatment. Synthetic folic acid and dietary folate are required in methyl transfer reactions throughout the body. Dietary folate is found attached to several glutamate structures, most of which must be removed prior to absorption by the intestinal zinc-dependent enzyme called conjugase. Several factors may decrease folate absorption, including zinc deficiency, chronic alcohol consumption, and overconsumption of conjugase inhibitors commonly found in legumes, lentils, cabbage, and oranges. Synthetic folic acid does not require digestion prior to absorption. Following absorption, folate and folic acid are eventually converted into 5-methyl tetrahydrofolate (THF) in the irreversible reaction catalyzed by methylene THF reductase (MTHFR) as shown in Figure 1. Homocysteine, an amino acid derivative thought to cause oxidative stress, is converted back to methionine with the aid of 5-methyl THF and vitamin B12. Methionine is then converted into S-adenosylmethionine (SAMe), the compound responsible for numerous transmethylation reactions in the body, including synthesis of membrane phospholipids, metabolism of neurotransmitters (serotonin, epinephrine, norepinephrine, and melatonin), DNA synthesis and repair, and formation of myelin. [96, 97] Recent animal data suggests that low folate diets during pregnancy decreases synthesis of myelin basic protein in the cerebral cortex. Thus, maternal folate depletion may have profound effects on neuronal signaling and production of neurotransmitters. Serum folate concentrations and dietary folate intake have consistently been inversely associated with depressive symptoms. [99–102] A recent meta-analysis determined that low folate status was associated with a 55% increased risk of depression, regardless of whether the population was subject to mandatory folic acid fortification or the method of folate assessment (dietary intake by food frequency questionnaire vs. serum folate levels). Low serum folate concentration combined with depressive symptoms during pregnancy was significantly correlated with shorter gestational age and lowest birth weight infants. Folate studies related to PPD have not been conducted, but it can be hypothesized that folate depletion caused by pregnancy and inadequate folate repletion between pregnancies may increase the risk of PPD. 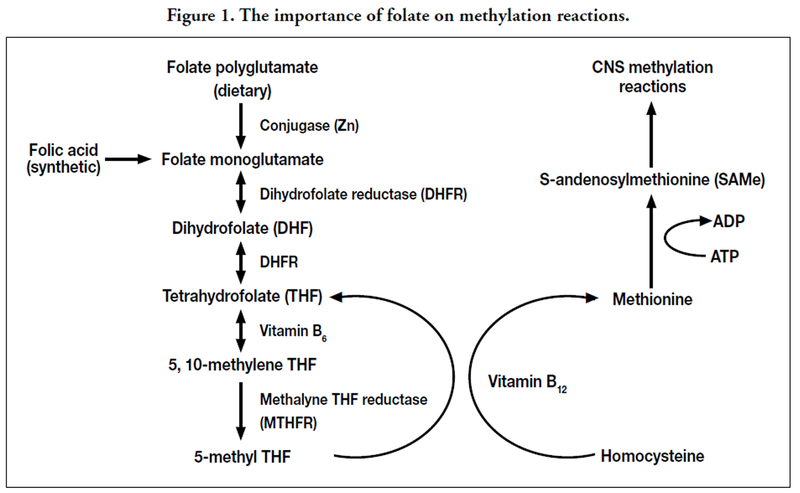 Folate metabolism requires the rate-limiting MTHFR enzyme, which has been shown to contain several genetic polymorphisms. The most widely studied of which is the C677T genetic variant which may contain either the normal cytosine (C) or the variant thymine (T) at the 677th nucleotide position. Three possible genotypes exist depending on which nucleotides are found in both alleles (CC, CT, or TT). The 677CC genotype retains normal MTHFR activity, the 677CT polymorph has 65% of the activity, and the 677TT variant has only 30% of the MTHFR activity; thus, daily folate requirements are increased in order to maintain normal serum folate concentrations. Carrying the homozygous 677TT MTHFR variant has been positively correlated with depression, schizophrenia, and bipolar disorder. [106–111] Therefore, a genetic component exists that, when combined with folate depletion caused by pregnancy, may exacerbate the risk of PPD in susceptible populations. Limited studies exist for the use of folic acid supplementation alone for treatment of depression. Older trials suggest a benefit, but most use 50 times the tolerable upper intake level for folate. [112–114] A recent study suggests that a prenatal supplement containing folic acid was not beneficial for decreasing depressive episodes during pregnancy. Patients with low folate status were shown to be less likely to respond to antidepressant therapy. [116, 117] Several studies have shown an improvement on depression measures when folic acid is taken in combination with antidepressant medications. [118–121] Hence, improving folate status through dietary or supplemental interventions may be beneficial for decreasing depressive symptoms and is an effective adjuvant for patients not responding well to antidepressant treatment. More research is warranted to determine the effect of folate status, genetic polymorphisms, and folic acid supplementation on the risk or prevention of PPD. Iron is an essential component of hemoglobin in red blood cells (RBC), whose primary responsibility is to carry oxygen. Iron-dependent enzymes are found in the pathways that generate and catabolize neurotransmitters and promote myelination of white matter and the spinal cord. Iron deficiency can lead to anemia and inefficient oxygen delivery to cells. Twelve percent of all females of childbearing age in the U.S. have iron deficiency anemia. Maternal iron requirements are markedly increased during pregnancy due to enhanced RBC synthesis, fetal requirement, and blood loss during childbirth. An established prenatal iron deficiency coupled with increased iron requirements may further impair proper brain signaling. Maternal iron deficiency or diminished concentrations of markers of iron status, such as hemoglobin and storage ferritin, have been associated with increased risk of PPD. [124–126] Low ferritin concentrations detected immediately after delivery were associated with a 273% increased risk of PPD at 32 weeks postpartum. Iron deficiency anemia associated with low hemoglobin concentrations significantly increased the risk of general depression in an older population in a dose-dependent manner, such that the lowest hemoglobin concentration was associated with the most severe depression. Future studies are required to assess doses of iron supplements during pregnancy that are effective for treatment of PPD and safe for the mother and fetus. Next to iron, zinc has the second highest concentration of all transition metals in the brain. Zinc is a required cofactor for more than 300 different enzymes in the body; whereas zinc deficiency leads to enzyme dysfunction. Zinc is required for normal neuronal synthesis and has been shown to be essential in modulation of inhibitory and excitatory receptors for neurotransmitters. [129, 130] Serum zinc concentrations have been inversely correlated with depressive symptoms. [131–134] A pilot study conducted by Wójcik et al. determined that serum zinc concentrations decreased during pregnancy reaching their lowest immediately after delivery, but rebounding within a month postpartum. Patients diagnosed with PPD using the EPDS as a screening tool had 24% lower serum zinc concentrations 3 days following delivery compared to those not diagnosed with PPD. Very few studies have used zinc supplementation as an intervention for depression. A recent pilot study gave young women a multivitamin with or without an additional 7 mg of zinc. Additional zinc supplementation was shown to increase serum zinc concentrations and significantly decreased anger and depression scores compared to the multivitamin alone. The addition of zinc to antidepressant therapy has been shown to significantly decrease scores on depression inventories as compared to standard antidepressant therapy alone. Effects of serum concentrations on zinc supplementation seem to be modulated by inflammation. Patients with chronic inflammation subjected to high dose zinc supplementation did not show an increase in serum zinc concentrations. As discussed previously, PPD is associated with higher levels of inflammation, which may first need to be remedied prior to zinc supplementation. Copper, magnesium, and selenium are also minerals important in brain chemistry. Minimal research has been conducted on these micronutrients. Current research that does exist suggests an elevation in serum copper, as occurs during pregnancy, is associated with PPD in women with a family history. The association of magnesium deficiency during pregnancy leading to PPD has garnered mixed results. [135, 140, 141] Recent research in nursing home residents has discerned an association between low serum selenium and depression, which was improved through selenium supplementation. Another study showed that selenium supplementation during pregnancy decreased EPDS scores 8 weeks postpartum. More double-blind placebo-controlled trials are required to determine the effects of micronutrient deficiencies and subsequent supplementation on the risk of PPD before recommendations can be made. Numerous other factors have been implicated to increase the risk of PPD. Several meta-analyses have determined that the following non-nutritional factors significantly increase the risk of PPD: prenatal depression, socioeconomic status, marital status, child care stress, social support, infant temperament, multiple births, and unexpected pregnancy. [144–147] Recent research has also implicated sleep quality and employment status as other risk factors. Miyake et al. determined that having a full-time job decreased the risk of PPD by 48% compared to those unemployed. Pregnant women holding a professional or technical position further decreased risk of PPD by 71%. Poor sleep quality was associated with recurrence of PPD in women with previous history of depression. For each 1 point change in sleep quality score, a 25% increased risk of PPD was indicated. Lack of exercise and postpartum weight retention have also been implicated as potential risk factors for PPD. The risk of PPD increased 154% in women who had retained at least 5 kg (11 lb.) of pregnancy weight. The odds of retaining at least 5 kg in the first year postpartum increased 24% for every hour spent watching television/day and 33% for every 0.5% increment of daily caloric intake as trans fat, which is representative of an unhealthy, processed diet. The same study also determined that for every hour spent walking per day the odds of retaining pregnancy weight decreased by 34%. Interestingly, women with greater knowledge in nutrition retained significantly less pregnancy weight than their uneducated counterparts. Therefore, nutritional education may be an important factor in reducing weight retention and thus, decreasing the risk of PPD. Iron and folic acid supplements can be taken simultaneously shortly after a meal. Vitamin D, n-3 as pure or primarily EPA, and calcium can be taken together at a meal containing at least 5–10 g of fat to increase absorption of the n-3 and lipidsoluble vitamin D.
Zinc should be taken alone and on an empty stomach, 1 hour prior to a meal or 2 hours following a meal. Depressed patients not responding to antidepressant therapy may benefit from supplementation of folate, zinc, or EPA. Female patients of childbearing age may also benefit from an encouraging discussion on the advantages of healthy eating and exercise in preventing PPD. Overall, there are several nutritional and non-nutritional risk factors for PPD. Screening for PPD is not standardized and many women with PPD are not diagnosed; therefore, adding the PDSS or EPDS surveys to your diagnostic toolbox may provide an added service to patients not currently being assisted in other healthcare realms. Leung BMY, Kaplan BJ. Perinatal depression: prevalence, risks, and the nutrition link — a review of the literature. J Am Diet Assoc 2009; 109:1566-75. Wisner KL, Chambers C, Sit DKY. Postpartum depression: a major public health problem. J Am Med Asso 2006; 296:2612-18. Gavin NI, Gaynes BN, Lohr KN, Meltzer-Brody S, Gartlehner G, Swinson T. Perinatal depression: a systematic review of prevalence and incidence. Obstet Gynecol 2005; 106:1071-83. Stein A, Gath DH, Bucher J, Bond A, Day A, Cooper PJ. The relationship between post-natal depression and mother-child interaction. Br J Psychiatry 1991; 158:46-52. Righetti-Veltema M, Bousquet A, Manzano J. Impact of postpartum depressive symptoms on mother and her 18-month old infant. Eur Child Adolesc Psychiatry 2003; 12:75-83. Hay DF, Pawlby S, Angold A, Harold GT, Sharp D. Pathways to violence in the children of mothers who were depressed postpartum. Dev Psychol 2003; 39:1083-94. Ueda M, Yamashita H, Yshida K. Impact of infant health problems on postnatal depression: pilot study to evaluate a health visiting system. Psychiatry Clin Neurosci 2006; 60:182-9. Tomlinson M, Cooper PJ, Setin A, Swartz L, Moltero C. Postpartum depression and infant growth in a South African periurban supplement. Child Care Health Dev 2006; 32:81-83. Wolf AW, DeAndraca I, Lozoff B. Maternal depression in three Latin American samples. Soc Psychiatry Psychiatr Epidemiol 2002; 37:169-176. Hearn G, Iliff A, Jones I, Kirby A, Ormiston P, Parr P, et al. Postnatal depression in the community. Br J Gen Pract 1998; 48:1064-1066. Judge MP, Beck CT. Handbook of nutrition and pregnancy: postpartum depression and the role of nutritional factors. Totowa: Humana Press; 2008. Beck CT, Gable RK. Postpartum depression screening scale manual. Los Angeles: Western Psychological Services; 2002. Cox JL, Holden JM, Sagovsky R. Detection of postnatal depression: development of the 10-item Edinburgh Postnatal Depression Scale. Br J Psychiatry 1987; 97:145-54. Kroenke K, Spitzer RL, Williams JB. The PHQ-9: validity of a brief depression severity measure. J Gen Intern Med 2001; 16:606-13. Whooley MA, Avins AL, Miranda J, Browner WS. Case-finding instruments for depression: two questions are as good as many. J Gen Intern Med 1997; 12:439-45. Arroll B, Goodyear-Smith F, Kerse, N, Fishman T, Gunn J. Effect of the addition of a ‘help’ question to two screening questions on specificity for diagnosis of depression in general practice: diagnostic validity study. Br Med J 2005; 331:884-7. Gjerdingen D, Crow S, McGovern P, Miner M, Center B. Postpartum depression screening at well-child visits: validity of a 2-question screen and the PHQ-9. Ann Fam Med 2009; 7:63-70. King JC. Physiology of pregnancy and nutrient metabolism. Am J Clin Nutr 2000; 71(Suppl):1218S-25S. Marino DD. Protein utilization during early and late human pregnancy. PhD Thesis, University of California, Berkley; 1983. Fitch WL, King JC. Plasma amino acid, glucose, and insulin responses to moderate-protein and high-protein test meals in pregnant, nonpregnant, and gestational diabetic women. Am J Clin Nutr 1987; 46:243-9. Rees AM, Austin MP, Parker G. Role of omega-3 fatty acids as a treatment for depression in the perinatal period. Aust N Z J Psychiatry 2005; 39:274-80. Hambidge KM, Krebs NF, Jacobs MA, Favier A, Guyette L, Ikle DN. Zinc nutritional status during pregnancy: a longitudinal study. Am J Clin Nutr 1983; 37:429-42. Cikot RJLM, Steegers-Theunissen RPM, Thomas CMG, de Boo TM, Merkus HMWM, Steegers EAP. Longitudinal vitamin and homocysteine levels in normal pregnancy. Br J Nutr 2001; 85:49-58. Bruinse HW, van den Berg H. Changes of some vitamin levels during and after normal pregnancy. Eur J Obstet Gynecol Reprod Biol 1995; 61:31-7. Langley-Evans S. Nutrition: a lifespan approach. West Sussex: John Wiley & Sons, Ltd. 2009:50. Goodnight W, Newman R. Optimal nutrition for improved twin pregnancy outcome. Obstet Gynecol 2009; 114:1121-34. Scholl TO, Reilly T. Anemia, iron and pregnancy outcome. J Nutr 2000; 130(Suppl):443S-7S. Picciano MF. Pregnancy and lactation: physiological adjustments, nutritional requirements and the role of dietary supplements. J Nutr 2003; 133(Suppl):1997S-2002S. Kovacs CS. Calcium and bone metabolism in pregnancy and lactation. J Clin Endocrinol Metab 2001; 86:2344-8. Kovacs CS. Vitamin D in pregnancy and lactation: maternal, fetal, and neonatal outcomes in human and animal trials. Am J Clin Nutr 2008; 88(Suppl):520S-8S. Jarjou LMA, Laskey MA, Sawo Y, Goldberg GR, Cole TJ, Prentice A. Effect of calcium supplementation in pregnancy on maternal bone outcomes in women with a low calcium intake. Am J Clin Nutr 2010; 92:450-7. Merewood A, Mehta SD, Grossman X, Chen TC, Mathieu JS, Holick MF, et al. Widespread vitamin D deficiency in urban Massachusetts newborns and their mothers. Pediatrics 2010; 125:640-7. Milman N, Byg K-E, Hvas A-M, Bergholt T, Eriksen L. Erythrocyte folate, plasma folate and plasma homocysteine during normal pregnancy and postpartum: a longitudinal study comprising 404 Danish women. Eur J Haematol 2006; 76:200-5. Smits LJM, Essed GGM. Short interpregnancy intervals and unfavorable outcome: role of folate depletion. Lancet 2001; 358:2074-7. Scholl TO, Johnson WG. Folic acid: influence on pregnancy outcome. Am J Clin Nutr 2000; 71(Suppl):1295S-1303S. Heseker HB, Mason JB, Selhub J, Rosenberg IH, Jacques PF. Not all cases of neural-tube defect can be prevented by increasing the intake of folic acid. Br J Nutr 2009; 102:173-80. Center for Disease Control. Folate status in women of childbearing age, by race/ethnicity — United States, 1999-2000, 2001- 2002, and 2003-2004. MMWR 2007; 55:1377-80. Yang Q-H, Carter HK, Mulinare J, Berry RJ, Friedman JM, Erickson JD. Race-ethnicity differences in folic acid intake in women of childbearing age in the United States after folic acid fortification: findings from the Nation Health and Nutrition Examination Survey, 2001-2002. Am J Clin Nutr 2007; 85:1409-16. Hallberg L. Does calcium interfere with iron absorption? Am J Clin Nutr 1998; 68:3-4. Institute of Medicine. Dietary reference intakes. Calcium, phosphorus, magnesium, vitamin D, and fluoride. Washington, DC: National Academy Press, 1999. Straub DA. Calcium supplementation in clinical practice: a review of forms, doses, and indications. Nutr Clin Pract 2007; 22:286-96. Lonnerdal B. Iron-zinc-copper interactions. In: Micronutrient interactions: impact on child health and nutrition. Washington, DC: ILSI Press, 1996: 3-10. Lapido OA. Nutrition in pregnancy: mineral and vitamin supplements. Am J Clin Nutr 2000; 72(Suppl):280S-90S. Conde-Agudel A, Rosas-Bermúdez A, Kafury-Goeta AC. Birth spacing and risk of adverse perinatal outcomes: a meta-analysis. J Am Med Assoc 2006; 295:1809-23.
van Eijsden M, Smits LJM, van der Wal MF, Bonsel GJ. Association between short interpregnancy intervals and term birth weight: the role of folate depletion. Am J Clin Nutr 2008; 88:147-53. Nakamura MT, Nara TY. Structure, function, and dietary regulation of ?-6, ?-5, and ?-9 desaturases. Annu Rev Nutr 2004; 24:345-76. Cho HP, Nakamura M, Clarke SD. Cloning, expression, and fatty acid regulation of the human delta-5 desaturase. J Biol Chem 1999; 274:37335-9. Cho HP, Nakamura MT, Clarke SD. Cloning, expression, and nutritional regulation of the mammalian delta-6 desaturase. J Biol Chem 1999; 274:471-7. Warensjö E, Risérus U, Gustafsson I-B, Mohsen R, Cederholm T, Vessby B. Effects of saturated and unsaturated fatty acids on estimated desaturase activities during a controlled dietary intervention. Nutr Metab Cardiovasc Dis 2008; 18:683-90. Araya J, Rodrigo R, Pettinelli P, Aray AV, Poniachik J, Videla LA. Decreased liver fatty acid ?-6 and ?-5 desaturase activity in obese patients. Obesity 2010; 18:1460-3. Xie L, Innis SM. Association of fatty acid desaturase gene polymorphisms with blood lipid essential fatty acids and perinatal depression among Canadian women: a pilot study. J Nutrigenet Nutrigenomics 2009; 2:243-50. Zhou L, Nilsson A. Sources of eicosanoid precursor fatty acid pools in tissues. J Lipid Res 2001; 42:1521-42. McNamara RK, Carlson SE. Role of omega-3 fatty acids in brain development and function: potential implications for the pathogenesis and prevention of psychopathology. Prostaglandins Leukot Essent Fatty Acids 2006; 75:329-49. Delgado PL. Depression: the case for a monoamine deficiency. J Clin Psychiatry 2000; 61:7-11. Ramakrishnan U, Imhoff-Kunsch B, DiGirolamo AM. Role of docosahexaenoic acid in maternal and child mental health. Am J Clin Nutr 2009; 89(Suppl):958S-62S. Maes M, Smith RS. Fatty acids, cytokines, and major depression. Biol Psychiatry 1998; 43:313-4. Raison CL, Capuron L, Miller AH. Cytokines sing the blues: inflammation and the pathogenesis of major depression. Trend Immunol 2006; 27:24-31. Zorilla EP, Luborsky L, McKay JR, Roesnthal R, Houldin A, Tax A, et al. The relationship of depression and stressors to immunological assays: a meta-analytic review. Brain Behav Immun 2001; 15:199-226. Miller AH. Mechanisms of cytokine-induced behavioral changes: psychoneuroimmunology at the translational interface. Brain Behav Immun 2009; 23:149-58. Besedovsky HO, del Rey A. Immune-neuro-endocrine interactions: facts and hypotheses. Endocr Rev.1996; 17:64-102. Pariante CM, Miller AH. Glucocorticoid receptors in major depression: relevance to pathophysiology and treatment. Biol Psychiatry 2001; 49:391-404. Bernardino L, Agasse F, Silva B, Ferreira R, Grade S, Malva JO. Tumor necrosis factor-alpha modulates survival, proliferation, and neuronal differentiation in neonatal subventricular zone cell cultures. Stem Cells 2008; 26:2361-71. Goshen I, Kreisel T, Ounallah-Saad H, Renbaum P, Zalzstein Y, Ben-Hur T, et al. A dual role for interleukin-1 in hippocampaldependent memory processes. Psychoneuroendocrinology 2007; 32:1106-15. McDade TW, Hawkley LC, Cacioppo JT. Psychosocial and behavioral predictors of inflammation in middle-aged and older adults: The Chicago health, aging, and social relations study. Psychosom Med 2006; 68:376-81. Kiecolt-Glaser JK, Loving TJ, Stowell JR, Malarkey WB, Lemeshow S, Dickinson SL, et al. Hostile marital interactions, proinflammatory cytokine production, and wound healing. Arch Gen Psychiatry 2005; 62:1377-84. Miller GE, Chen E, Sze J, Marin T, Arevalo JM, Doll R, et al. A functional genomic fingerprint of chronic stress in humans: blunted glucocorticoid and increased NF-kappaB signaling. Biol Psychiatry 2008; 64:266-72. Motivala SJ, Sarfatti A, Olmos L, Irwin MR. Inflammatory markers and sleep disturbance in major depression. Psychosom Med 2005; 67:187-94. Irwin MR, Wang M, Ribeiro D, Cho HJ, Olmstead R, Breen EC, et al. Sleep loss activates cellular inflammatory signaling. Biol Psychiatry 2008; 64:538-40. Rush AJ. STAR*D: what have we learned. Am J Psychiatry 2007; 164:739-52. Benedetti F, Lucca A, Brambilla F, Colombo C, Smeraldi E. Interleukine- 6 serum levels correlate with response to antidepressant sleep deprivation and sleep phase advance. Progr Neuropsychopharmacol Biol Psychiatry 2002; 26:1167-70. Lanquillon S, Krieg JC, Bening-Abu-Shach U, Vedder H. Cytokine production and treatment response in major depressive disorder. Neuropsychopharmacology 2000; 22:370-9. Sluzewska A, Sobieska M, Rybakowski JK. Changes in acutephase proteins during lithium potentiation of antidepressants in refractory depression. Neuropsychobiology 1997; 35:123-7. Zhao Y, Joshi-Barve W, Barve S, Chen LH. Eicosapentaenoic acid prevents LPS-induced TNF-alpha expression by preventing NF-kB activation. J Am Coll Nutr 2004; 23:71-8. Kiecolt-Glaser JK, Belury MA, Porter K, Beversdorf D, Lrmeshow S, Glaser R. Depressive symptoms, n-6:n-3 fatty acids, and inflammation in older adults. Psychosom Med 2007; 69:217-24. Parker G, Gibson NA, Brotchie H, Heruc G, Rees AM, Hadzi- Pavlocic D. Omega-3 fatty acids and mood disorders. Am J Psychiatry 2006; 163:969-78. Lima P-Y, Huangb S-Y, Subc K-P. A meta-analytic review of polyunsaturated fatty acid compositions in patients with depression. Biol Psychiatry 2010; 68:140-7. Colangelo LA, He K, Whooley MA, Daviglus ML, Liu K. Long-chain omega-3 polyunsaturated fatty acids are inversely associated with depressive symptoms in women. Nutrition 2009; 25:1011-9. Hibbeln JR. Seafood consumption, the DHA content of mothers’ milk and prevalence rates of postpartum depression: a crossnational, ecological analysis. J Affective Disord 2002; 69:15-29. Strøm M, Mortensen EL, Halldorsson TI, Thorsdottir I, Olsen SF. Fish and long chain n-3 polyunsaturated fatty acid intakes during pregnancy and risk of postpartum depression: a prospective study based on a large national cohort. Am J Clin Nutr 2009; 90:149-55. Miyake Y, Sasaki S, Yokoyama T, Tanaka K, Ohya Y, Fukushima W, et al. Risk of postpartum depression in relation to dietary fish and fat intake in Japan: the Osaka Maternal and Child Health Study. Psychol Med 2006; 36:1727-35. Llorent AM, Jensen CL, Voigt RG, Fraley JK, Berreta MC, Heird WC. Effect of maternal docosahexaenoic acid supplementation on postpartum depression and information processing. Am J Obstet Gynecol 2003; 188:1348-53. Freeman MP, Hibbeln JR, Wisner KL, Brumback BH, Watchman M, Gelenberg AJ. Randomized dose-ranging pilot trial of omega-3 fatty acids for postpartum depression. Acta Psychiatr Scand 2006; 113:31-5. Rees AM, Austin MP, Parker GB. Omega-3 fatty acids as a treatment for perinatal depression: randomized double-blind placebo-controlled trial. Aust N Z J Psychiatry 2008; 42:199- 205. Freeman MP, Davis M, Sinha P, Wisner KL, Hibbeln JR, Gelenberg AJ. Omega-3 fatty acids and supportive psychotherapy for perinatal depression: a randomized placebo-controlled study. J Affect Disord 2008; 110:142-8. Doornbod B, van Goor SA, Dijck-Brouwer DA, Schaafsma A, Korf J, Muskiet FA. Supplementation of a low dose of DHA or DHA+AA does not prevent peripartum depressive symptoms in a small population based sample. Prog Neuropsychopharmacol Biol Psychiatry 2009; 33:49-52. Su KP, Huang SY, Chiu TH, Huang KC, Huang CL, Chang HC, et al. Omega-3 fatty acids for major depressive disorder during pregnancy: results from a randomized, double-blind, placebo-controlled trial. J Clin Psychiatry 2008; 69:644-51. Freeman MP, Hibbeln JR, Wisner KL, Watchman M, Gelenberg AJ. An open trial of omega-3 fatty acids for depression in pregnancy. Acta Neuropsychiatrica 2006; 18:21-4. Makrides M, Gibson RA, McPhee AJ, Yelland L, Quinlivan J, Ryan P. Effect of DHA supplementation during pregnancy on maternal depression and neurodevelopment of young children: a randomized controlled trial. J Am Med Assoc 2010; 304: 1675-83. Appleton KM, Rogers PJ, Ness AR. Updated systematic review and meta-analysis of the effects of n-3 long-chain polyunsaturated fatty acids on depressed mood. Am J Clin Nutr 2010; 91:757-70. Martins JG. EPA but not DHA appears to be responsible for the efficacy of omega-3 long chain polyunsaturated fatty acid supplementation in depression: evidence from a meta-analysis of randomized controlled trials. J Am Coll Nutr 2009; 28:525-542. Peet M, Horrobin DF. A dose-ranging study of the effects of ethyl-eicosapentaenoate in patients with ongoing depression despite apparently adequate treatment with standard drugs. Arch Gen Psychiatry 2002; 59:913-9. Nemets B, Stahl Z, Belmaker RH. Addition of omega-3 fatty acid to maintenance medication treatment for recurrent unipolar depressive disorder. Am J Psychiatry 2002; 159:477-9. Frangou S, Lewis M, McCrone P. Efficacy of ethyl-eicosapentaenoic acid in bipolar depression: randomized double-blind placebo-controlled study. Br J Psychiatry 2006; 188:46-50. Jazayaeri S, Tehrani-Doost M, Keshavarz SA, Hosseini M, Djazayery A, Amini H, et al. Comparison of therapeutic effects of omega-3 fatty acid eicosapentaenoic acid and fluoxetine, separately and in combination, in major depressive disorder. Aust N Z J Psychiatry 2008; 42:192-8. Pfeffer C, Rogers L, Bailey L, Gregory J. Absorption of folate from fortified cereal grain products and of supplemental folate consumed with or without food determined using a dual label stable isotope protocol. Am J Clin Nutr 1997; 66:1388-97. Albert JE, Fava M. Nutrition and depression: the role of folate. Nutr Rev 1997; 55:145-9. Bottiglieri T, Hyland K, Reynolds EH. The clinical potential of ademethionine (S-adenosylmethionine) in neurologic disorders. Drugs 1994; 48:137-52. Lee JH, Lee YA, Oh KH, Chang N. Effects of dietary folic acid on the expression of myelin basic protein in the brain and spinal cord of pregnant and lactating rats. Ann Nutr Metab. 2010; 56:83-90. Morris MS, Fava M, Selhub J, Rosenberg IH. Depression and folate status in the US population. Psychother Psychosom 2003; 72:80-7. Tolmunen T, Hintikka J, Ruusunen A, Voutilainen S, Tanskanen A, Valkonen V-P, et al. Dietary folate and the risk of depression in Finnish middle-aged men: a prospective follow-up study. Psycother Psychosom 2004; 73:334-9. Beydoun MA, Shroff MR, Beydoun HA, Zonderman AB. Serum folate, vitamin B-12, and homocysteine and their association with depressive symptoms among U.S. adults. Psychosom Med 2010; 72:874-81. Murakami K, Miyake Y, Sasaki S, Tanaka K, Arakawa M. Dietary folate, riboflavin, vitamin B-6, and vitamin B-12 and depressive symptoms in early adolescence: the Ryukyus Child Health Study. Psychosom Med 2010; 72:763-8. Gilbrody S, Lightfoot T, Sheldon T. Is low folate a risk factor for depression: A meta-analysis and exploration of heterogeneity. J Epidemiol Community Health 2007; 61:631-7. Van Dijk AE, Van Eijsden M, Stronks K, Gemke RJBJ, Vrijkotte TGM. Maternal depressive symptoms, serum folate status, and pregnancy outcome: results of the Amsterdam Born Children and their Development study. Am J Obstet Gynecol 2010; 203:563.e1-7. Rozen R. Molecular genetics of methylenetetrahydrofolate reductase deficiency. J Inherit Metab Dis 1996; 19:589-94. Lewis SJ, Lawlor DA, Davey Smith G, Araya R, Timpson N, Day INM, et al. The thermolabile variant of MTHFR is associated with depression in the British Women’s Heart and Health Study and a meta-analysis. Molecular Psychiatry 2006; 11:352-60. Bjelland I, Tell GS, Vollset SE, Refsum H, Ueland PM. Folate, vitamin B12, homocysteine, and the MTHFR 677C-T polymorphism in anxiety and depression: the Hordaland HomoHomocysteine Study. Arch Gen Psychiatry 2003; 60:618-26. Kelly CB, McDonnell AP, Johnston TG, Mulholland C, Cooper SJ, McMaster D, et al. The MTHFR C677T polymorphism is associated with depressive episodes in patients from Northern Ireland. J Psychopharmacol 2004; 18:567-71. Bottiglieri T, Laundy M, Crellin R, Toone BK, Carney MWP, Reynolds EH. Homocysteine, folate, methylation, and monoamine metabolism in depression. J Neurol Neurosurg Psychiatry 2000; 69:228-32. Naumovski N, Veysey M, Ng X, Boyd L, Dufficy L, Blades B, et al. The folic acid endophenotype and depression in an elderly population. J Nutr Health Aging 2010; 14:829-33. Gilbrody S, Lewis, S, Lightfoot T. Methylenetetrahydrofolate reductase (MTHFR) genetic polymorphisms and psychiatric disorders: a HuGE review. Am J Epidemiol 2007; 165:1-13. Guaraldi GP, Fava M, Mazzi F, la Greca P. An open trial of methyltetrahydrofolate in elderly depressed patients. Ann Clin Psychiatry 1993; 5:101-5. Passeri M, Cucinotta D, Abate G, Senin U, Ventura A, Stramba Badiale M, et al. Oral 5’-methyltetrahydrofolic acid in senile organic mental disorders with depression: results of a double-blind multicenter study. Aging (Milano) 1993; 5:63-71. Godfrey PS, Toone BK, Bottiglien T, Laundy M, Reynolds EH, Carney MPH, et al. Enhancement of recovery from psychiatric illness by methylfolate. Lancet 1990; 336:392-5. Cho YJ, Han JY, Choi JS, Ahn HK, Ryu HM, Kim MY, et al. Prenatal multivitamins containing folic acid do not decrease prevalence of depression among pregnant women. J Obstet Gyneacol 2008; 28:482-4. Papakostas GI, Petersen T, Mischoulon D, Ryan JL, Nierenberg AA, Bottiglieri T, et al. Serum folate, vitamin B12, and homocysteine in major depressive disorder, Part 1: predictors of clinical response in fluoxetine-resistant depression. J Clin Psychiatry 2004; 65:1090-5. Alpert M, Silva RR, Pouget ER. Prediction of treatment response in geriatric depression from baseline folate level: interaction with an SSRI or a tricyclic antidepressant. J Clin Psychopharmacol 2003; 23:309-13. Coppen A, Bailey J. Enhancement of the antidepressant action of fluoxetine by folic acid: a randomised, placebo controlled trial. J Affect Disord 2000; 60:121-30. Alpert JE, Mischoulon D, Rubenstein GE, Bottonari K, Nierenberg AA, Fava M. Folinic acid (Leucovorin) as an adjunctive treatment for SSRI-refractory depression. Ann Clin Psychiatry 2002; 14:33-8. Resler G, Lavie R, Campos J, Mata S, Urbina M, Garcia A, et al. Effect of folic acid combined with fluoxetine in patients with major depression on plasma homocysteine and vitamin B12, and serotonin levels in lymphocytes. Neuroimmunomodulation 2008; 15:145-52. Coppen A, Bolander-Gouaille C. Treatment of depression: time to consider folic acid and Vitamin B12. J Psychopharmocol 2005; 19:59-65. Beard J. Iron deficiency alters brain development and functioning. J Nutr 2003; 133(Suppl):1468S-72S. Center for Disease Control. Iron deficiency — United States, 1999-2000. MMWR 2002; 51:897-9. Beard JL, Hendricks MK, Perez EM, Murray-Kolb LE, Berg A, Vernon-Feagans L, et al. Maternal iron deficiency anemia affects postpartum emotions and cognition. J Nutr 2005; 135:267-72. Corwin EJ, Murray-Kolb LE, Beard JL. Low hemoglobin level is a risk factor for postpartum depression. J Nutr 2003; 133:4139-42. Ondor G, Penninx BWJH, Cesari M, Bandinelli S, Lauretani F, Bartali B, et al. Anemia is associated with depression in older adults: results from the InCHIANTI Study. J Gerontol 2005; 60A:1168-72. Nowak G, Szewczyk B, Pilc A. Zinc and depression: an update. Pharmacol Rep 2005; 57:713-8. Wallwork JC. Zinc and the central nervous system. Prog Food Nutr Sci 1987; 11:203-47. Cuajungco MP, Lees GJ. Zinc metabolism in the brain: relevance to human neurodegenerative disorders. Neurobiol Dis 1997; 4:137-69. McLoughlin IJ, Hodge JS. Zinc in depressive disorder. Acta Psychiatr Scand 1990; 82:451–3. Maes M, Vandoolaeghe E, Neels H, Demedts P, Wauters A, Meltzer HY, et al. Lower serum zinc in major depression is a sensitive marker of treatment resistance and of the immune/ inflammatory response in that illness. Biol Psychiatry 1997; 42: 349–58. Maes M, de Vos N, Demedts P, Wauters A, Neels H. Lower serum zinc in major depression in relation to changes in serum acute phase proteins. J Affect Disord 1999; 56:189–94. Wojcik J, Dudek D, Schlegel-Zawadzka M, Grabowska M, Marcinek A, Florek E, et al. Antepartum/postpartum depressive symptoms and serum zinc and magnesium levels. Pharmacol Rep 2006; 58:571-6. Sawada T, Yokoi K. Effect of zinc supplementation on mood states in young women: a pilot study. Eur J Clin Nutr 2010; 64:331-3. Nowak G, Siwek M, Dudek D, Zieba A, Pilc A. Effect of zinc supplementation on antidepressant therapy in unipolar depression: a preliminary placebo-controlled study. Pol J Pharmacol 2003; 55:1143-7. Mburu ASW, Thurnham DI, Mwaniki DL, Muniu EM, Alumasa FM. The influence of inflammation on plasma zinc concentration in apparently healthy HIV+ Kenyan adults and zinc responses after a multi-micronutrient supplement. Eur J Clin Nutr 2010; 64:510-7. Crayton JW, Walsh WJ. Elevated serum copper levels in women with a history of post-partum depression. J Trace Elem Med Biol 2007; 21:17-21. Jacka FN, Overland S, Sterwart R, Tell GS, Bjelland I, Mykletun A. Association between magnesium intake and depression and anxiety in community-dwelling adults: the Hordaland Health Study. Aust N Z J Psychiatry 2009; 43:45-52. Imada Y, Yoshioka S, Ueda T, Katayama S, Kuno Y, Kawahara R. Relationships between serum magnesium levels and clinical background factors in patients with mood disorders. Psychiatry Clin Neurosci 2002; 56:509-14. Gosney MA, Hammond MF, Shenkin A, Allsup S. Effect of micronutrient supplementation on mood in nursing home residents. Gerontology 2008; 54:292-9. Mokhber N, Namjoo M, Tara F, Boskabadi H, Rayman MP, Ghayour-Mobarhan M, et al. Effect of supplementation with selenium on postpartum depression: a randomized double-blind placebo-controlled trial. J Maternal Fetal Neonatal Med 2011; 24:104-8. Beck CT. Predictors of postpartum depression: an update. Nurs Res 2001; 50:275-85. O’Hara M, Swain A. Rates and risk of postpartum depression: a meta-analysis. Int Rev Psychiatry 1996; 8:37-45. Robertson E, Grace S, Wallington T, Stewart D. Antenatal risk factors for postpartum depression: a synthesis of recent literature. 2004; Gen Hosp Psychiatry 26:289-95. Ross LE, McQueen K, Vigod S, Dennis C-L. Risk for postpartum depression associated with assisted reproductive technologies and multiple births: a systematic review. Hum Reprod Update 2011; 17:96-106. Herring SJ, Rich-Edwards JW, Oken E, Rifas-Shiman SL, Kleinman KP, Gillman MW. Association of postpartum depression with weight retention 1 year after childbirth. Obesity 2008; 16:1296-1301. Oken E, Taveras EM, Popoola FA, Rich-Edwards JW, Gillman MW. Television, walking, and diet: associations with postpartum weight retention. Am J Prev Med 2007; 32:305-11. Nuss H, Freeland-Graves J, Clarke K, Klohe-Lehman D, Milani TJ. Greater nutrition knowledge is associated with lower 1-year postpartum weight retention in low-income women. J Am Diet Assoc 2007; 107:1801-6.